With generative and motion-graphic visuals by META.is xDirector VolvoxLabs, the façade encompassed the exterior of THE LAB. 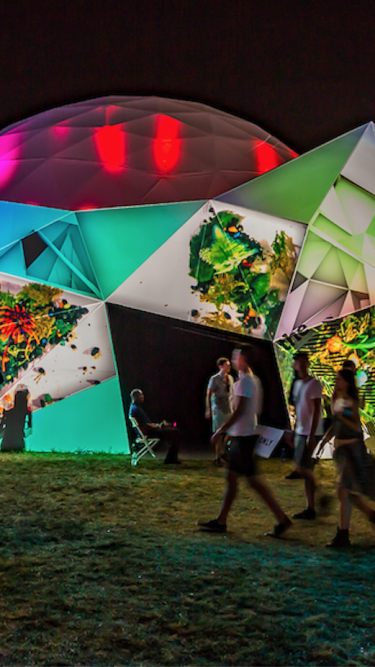 An ultra-high-definition video was projection-mapped onto THE LAB creating a visual journey. Onlookers stopped to take photos and videos in front of the ever-changing facade, and many danced in front of it, letting their shadows interplay with the projections. Titled Origins, VolvoxLabs created a visual journey employing a montage of fluid dynamics, microorganisms, data-driven interactions, living systems, and organic growth to evoke a sense of wonder. An ultra-high-definition video with real-life visualizations of organic forms was projection-mapped onto the surface of THE LAB facade, creating the illusion of being contained within its structure. The imagery was accompanied by VolvoxLabs’ signature live-generative performance, which heightened the visceral experience. The projections focused on the tension and symbiosis between organic systems and technology.